Notes: Gauge isn't important. Any size hook or yarn works here, but choice of yarn and hook will determine the finished size. Numbers in ( ) at the end of each round or row indicate the total number of stitches that should be in that round or row. Begin stuffing here if you haven't already. It's important to stuff the mushroom fairly firmly, and shape it as you progress. F/O leaving long tail. Using a chopstick or the back side of a large crohet hook, finish stuffing and shape the top. Using yarn needle weave the tail through the last round and pull to close. F/O and weave ends in on backside of disk. Using black yarn, choose the face 'area' (between two of the side spots) and make a few whipstitches for each eye. Using the same pattern you can make very small versions more suitable for phone charms or jewelry. These earrings and pendant I made quite some time back for my girls. Mario Brothers and the mushroom character is copyright Nintendo. This crochet pattern is an original pattern by Linda Potts (May 2009). Please do not claim this pattern as your own. If you wish to share this pattern, you may link to this pattern but please do not reprint it on your site. You may keep a copy for your own personal use but you may not sell or distribute it, or sell items made from this pattern. Wow, these are great!! Thank you for sharing!! Those are great...BTW...love all your stuff! You have all the trappings of a great designer. Keep up the great work and thanks for sharing your talent so generously with the rest of us. Love these little guys! Saw them at Rachels over at One Pretty Thing. I knew they were a must make! Forget fuzzy dice... these are going to hang off my rear view mirror! Thanks for a smile and inspiration! These are just awesome! I was wondering if you might be interested in a guest feature at our website, www.FaveCrafts.com. If so, you can contact me via the contact form at our website (bottom of page!). Thanks for sharing! Forget that I'm a sophomore in college... ANYWAY! EEk! I found these yesterday and TODAY I was assigned a swap partner I can use them for. How exciting! Anway, I just wanted to let you know I really appreciate that you not only take the time to figure these patterns out, but share them for free. =D Like I said, I'm a college kid, and I can't shell out $4 per pattern! I just though it'd be good to know the finished size for me was about 3.5 inches tall... The requirement I was up against was for 4inches (doh! ), but I think I'll make a block to stick him in to that extra half inch. I love your Mario Bros. patterns!! Could you make a pattern for Mario or Luigi? That would be cool!! Thank you very much :) You know there are some really good patterns online for Mario and Luigi already... I don't have any addresses handy at the moment, but I've seen some pretty amazing patterns available both for pay and for free :) You might try a google search for them? Very nice design! I can't wait to make some! Thanks a lot for sharing this pattern. I've made a lilac one, which is a little shy to a picture, but still cute though. My wife, [craftyknitter33], and I found your patterns over the weekend, and we had a blast making these. We also made your Pikachu, and Pokeball too. Thanks so much for taking the time and effort to share these patterns...and for free! You're very welcome! I'm glad you get as much enjoyment from the patterns as I do :D.
hey,, how bout try new cartoon? I've never successfully crocheted a toy, but HAVE to make a mushroom! They so cute! Brilliant pattern! It was extremely interesting for me to read this article. Thank you for it. I like such topics and anything connected to this matter. I would like to read more soon. It is very interesting for me to read this blog. Thank author for it. I like such topics and anything connected to this matter. I definitely want to read a bit more on that blog soon. omg im obsessed with all things mario lately!!! this is an awesome pattern. i can play the theme on the piano. i cant wait to make this into earrings!!! Amazing pattern! I'm so excited making this! I'm new at crocheting and I was curious if it's supposed to curl up at round 10 because I've pulled it out and redone it several times and it curls each time (and i reach a count of 60 sc total before making a full round) can you help me out? thanks so much for the pattern! 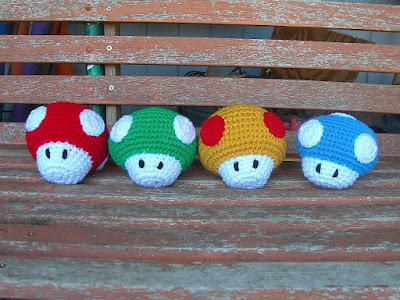 I wanna learn to crochet, just to make these. Would this be too advanced for a beginning project? These would be a good first 'in the round' project. Once you establish the basics of the stitches and understanding patterns, I think these would be great to try! awesome project! my friends are gonna love these. one question tho: when ever you start RD 2 do you crochet in the back loops or the front ones? As with all crochet, you always work through both loops unless told to work through front or back loops only. I just whipped one of these up yesterday. It worked up so easily - and perfectly! I can't wait to give it to my nephew this weekend. Thank you sooo much for sharing your creations with us! Are you planning on making a Princess Peach pattern? I'm new to crocheting and I'm not sure what some of the stuff means. What does sc in next 4 sc, dec over next 2 sc around mean? What that means is you work a single crochet in each of the next 4 single crochet stitches of the round, then you work a decrease over the next 2 single crochet. Repeat that sequence around to the beginning of the row. Thanks so much :) That helped alot. me encantan son muy lindos!!!! It means to put a single crochet in each of the next 2 single crochets, and then decrease over the next 2 single crochet (dec=decrease) repeat that sequence around to the end of the round. These are so fantastic! I'm making a giant one for my niece's birthday. :) Thanks for the great pattern! Hi! I'm still new to crocheting and was just wondering, when you say to join the colors, how do I do that? where can I find the video for this? or is there a video for how to make this? I don't create how to videos for my patterns. Firstly, I don't have the equipment to do that and secondly, I really dont have the time. I make these dolls and patterns in my spare time. I wuld jus luv 2 say THANK YOU! 4 all the patternz u have been so genorous with. I'm not sure how 2 actually verify my ggogle acct here but I do have a raverly acct wich s wer i found ur pattern. i have a pik of wat i've made but i still think urz look much nicer. Nonetheless i'm proud of wat i've made n it wuldnt have been possible witout u. To say that I am greatly appreciating your patterns is an understatement! However I'm a little stuck on this pattern. The bottom just isn't coming out like it shows in the picture. It's much too small and almost disappears into the cap. Do you have any idea what it is that I must be doing wrong? The bottoms of the mushrooms are fairly small in relation to the size of the caps. If it is unstuffed at this point, it will seem almost impossible - but it will shape up after stuffing. If this doesn't help, you can always add one or two rows to the bottom (stem) of the mushroom to give it more height if you prefer. I have a question, I'm pregnant and there is a pool going as to when I'll give birth. Would it be OK to make one of these for the winner of the pool? I just wanted to make sure that this wasn't against your wishes as it is your pattern. Thanks a bundle and happy crocheting! I think it's a cute idea! I have no problems at all with giving the dolls away (that's what they're for!) and as a prize in such a fun contest sounds like a great idea. This was my FIRST crochet project EVER! So cute! Thankyou! The rater: I find this very cute. No details are wrong. super cute! now my baby brother wants a ton of these! Thank you so much for your amazing patterns! A friend of mine turned me on to your crocheting projects (which are all absolutely adorable!) and I was wondering if we could use some of the patterns to make the plushies and sell them in order to raise money for charities? I'm not sure how you would feel about that, so I figured I'd ask first. It's ok to make a few to donate to charity. What I try to prevent is people using the patterns to make dolls en masse and sell for profit. I'm still very confused by rnd 10 :( I'm definitely reaching 60 before I even get close to the first stitch. Please help! You need to repeat the sequence (sc in each of next 3 sc, 2 sc in next sc) around to the end. so, we can give them to people ,but we cant sell them like on etsy? but, what if we tell the buyer that you are the originater of these adorable mushrooms!!! Hi, just wanted to say your patterns are amazing. My daughter is wanting me to make her a propeller hat from New Super Mario Brothers Wii...do you have any plans to make a pattern for it? It;d be adorable. Hi, you are such a treasure to the Amigurumi world! I wanted to let you know i tried your mushroom, and it was such fun to make, and i rather love how it turned out. I put a phot on my blog, and a link back to here. These are great!! 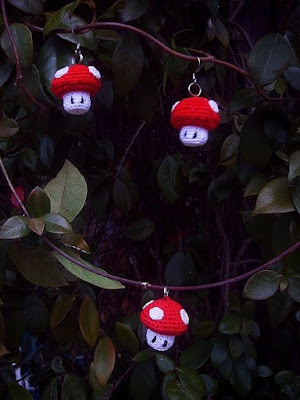 If it wasn't for these mushrooms, I would never have learned to crochet!! Thanks so much for sharing your patterns!!!! Hi! I love this pattern! I just have a question about sewing on the spots. How did you do that? It seems really awkward for me to try and sew them on. Is there any special way you held it, or how you sewed it on? I used matching sewing thread and a sewing needle. You only need to catch the 'top' layer of the crochet work... there is no need to go all the way underneath the crochet, just catch a reasonable amount on the 'surface' :D Use evenly placed, small stitches, relatively close to each other for a smoother finish. Now I want to thank you for your pattern. It will be a present for my little brother and my sister. We love Mario. I found this pattern easy (I'm 15), the only problem was that the explanation is in english^^' but I understood it all the same. Hi.Very nice pattern.i made a mushroom using your pattern.You can visit my blog to see it.Thanks a lot for giving this pattern for free. I have a question. I love all your patterns by the way, you are awesome but.. I always seem to come out with significantly bigger things than you (or my one friend also following your pattern). We both made your oddish and hers came out small and round and mine came out huge and oval shaped. I was wondering what I'm doing wrong or how I can fix this? Cause I'm making the stitches as tight as I can. I can't pull the hook through if I make it any tighter. And it seems like some things are to scale and some aren't.. I made your cyndaquil and I had to fold the stripe in several places to have it fit right, and the legs were big, but the rest was fine. I'm so confused. Help? There are many things that can affect how the end results come out. The brand,type,size,texture of the yarns you are using, the hook you're using (even the same size hook but different brands can result in slightly different sizes) and of course your individual tension. Yarn is probably the greatest factor in this. A 'worsted' weight yarn from one brand to the next, can be very different in it's texture and 'hand'. Some worsted yarns are softer and crush down more with each stitch and result in a smaller size, while other yarns are firmer and don't crush down as much, with the end result being a larger piece. One other factor is how you stuff the finished piece. If you stuff firmly, it might end up larger than if you stuff it slightly less. Overstuffing can also change the shape of the pieces. Even when I make the same doll over again, I won't come out with one the exact same size/dimensions as the one before it. That's why often times I'll mention that you need to fit the pieces as you crochet them, in order to be sure they'll fit... because so many factors can change it. You can easily adjust pieces to fit as you go... such as with cyndaquils stripe.... sometimes you have to just eyeball things and make fewer stitches here, or more stitches there to get the proper fit. I would just like to say thank you so much for the pattern and inspiration. My daughter is 10 and just loves Mario Bros, so I just had to give these a go - I have made three, with just the blue one to go now. I am new to crochet and this has been the first pattern I have followed and you have made it so easy. They make me smile every time I look at them. Hi, I just wanted to leave a comment for you. I love your work. I've made Mario and the mushrooms for a family member and my banker's child, now he has come and asked me if I would make another mushroom for a friend of his families. Thank you again. I just happened upon your Mario Mushrooms pattern and from there have checked out some of your other stuff, it's amazing! Your very talented, and thank you for sharing your work and patterns for free, that's awesome!!! I was wondering if you could tell me what size hook (in US sizes) you used for the 4 Mushrooms on the bench? OMG, your stuff is amazing!! I know that some crafters dont like to let you know they make things, but Thank you so very much for sharing your patterns. I just stumbled across your site and cant wait to start making the stuffed animals and game folks to share with my children and friends who will love them as gifts. Thank you again for sharing and you are so talented and are blessed with a special gift. I'm trying to make a monkey ive looked everywere but,only found 1 monkey that satisfied me and would like to know if you could try it and post the pattern on your page. Here is the website to it so you can take a look at this cute little monkey. Sorry for the bother. Hope you can do this soon. No, I won't post a pattern for that monkey. That's not my design, and to 'post' a pattern for it would be stealing. The pattern for that monkey is available in an ebook/calendar, available here: http://www.interweavestore.com/Crochet/Patterns/Crochet-Me-Presents-the-2012-Amigurumi-Calendar-Projects-eBook.html. I only post patterns for dolls when I designed the pattern myself, I don't post other people's patterns, that's a very wrong thing to do. I think these are so cute! My friends love Mario and I think these will make great gifts for them. Thank you for posting them! I have a favorite to ask you. My friends are going to Thailand for a mission trip and we are earning money for them this May by having a fundraiser. It is a bake sale, craft sale, ect. I am very crafty (well, both ways;p) and I was wondering if I could have your personal permission to sell these there for my friends. I will not be making any personal profit. I love these mushrooms!! I was just wondering, if I wanted to make a bigger mushroom, do I just times everything by 2 to get a bigger doll? My boy loved his new soft toy, altough my original plan was to knit a pincushion, LOL! And what front loops are you talking about? Im confused and Im new. My mushroom is almost finished and it looks nice! Thanks for sharing! How can i make a smaller one? Do you just cut the stiches in 1/2? How about the rounds? I'm going on a 'shroom bender tonight and tomorrow to start on Christmas gifts and to hold up my end of the deal on a craft exchange for a fellow nerd! My first one came out pretty fugly but the rest are attractive. I'm building an army. I'll share a link when I'm through so you can see the sheer insanity of twenty mushrooms taking over stuff, thanks to you! Thank you so much for your awesome patterns! I am currently planning a Mario Party for my boys joined birthday party and am making 40 (yikes) of these mushrooms in all varieties for the gift bags! Is there a way you can post how many chains you start with? so pretty!thank you so much!! Thaks for such a great pattern. I made all these this weekend! If you want to see, I have pictures on www.adventuresincrafterland.wordpress.com. My daughter now wants me to create a mushroom army! Thanks very much for posting this pattern I absolutly loved it!! I'm a Belgian Crocheter and I like this pattern. I translated this for me in french. Can I share this translating on my blog WITH a link and Your name ? If you aren't agree, I will understand. I’ve just refound crochet after ahem 35 ish years and this is my first welcome back project! I love it, thanks so much, easy to follow even as a noob! Going to try king boo next!!! very interesting very good article thanks.